How long will my VertDesk v3 last? We tested to find out. 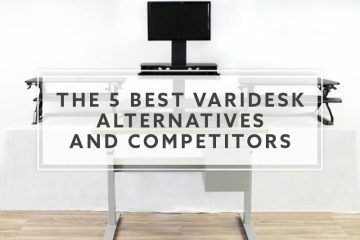 You are at :Home»Buying Tips and Guides»Standing Desk Tips and Guides»How long will your VertDesk v3 last? We tested to find out. 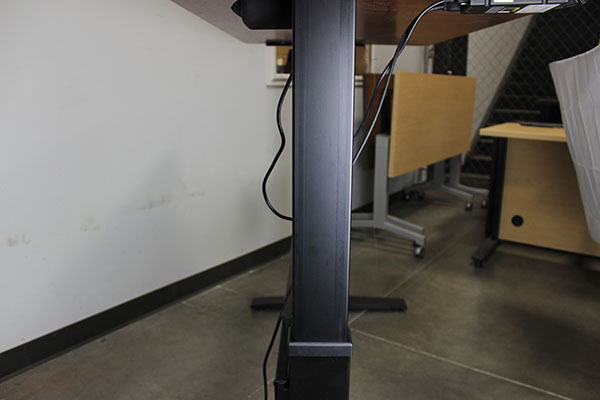 One of the most common concerns amongst electric standing desk customers is the expected lifetime of their new desk. It’s a great question and because these desks include electronics, there is definitely an opportunity for problems. While many of the brands will claim that their desk was cycle tested, the real question is if any actually witnessed the testing. 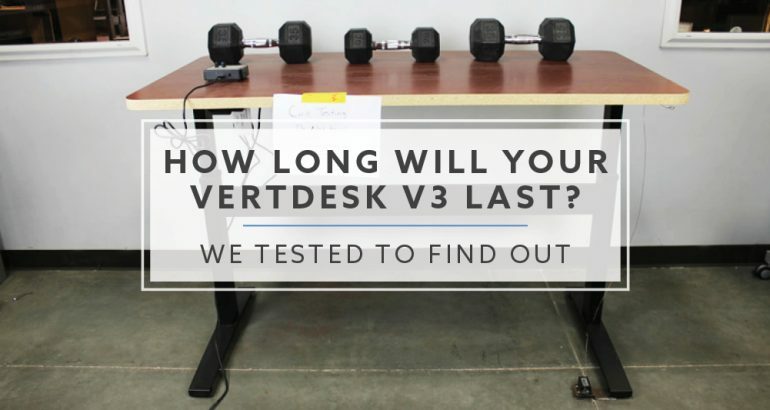 We wanted to push our VertDesk v3 to the limit and see how far we could take it before failure. Checking components before and after to witness for ourselves what it looked like after being put through a lifetime of adjustments. Let’s take a closer look at our test process and what we found. 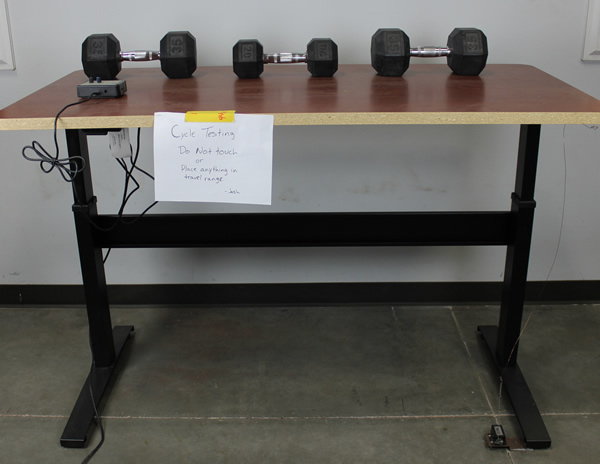 The test setup included a 30” x 60” VertDesk v3, we added 90 lbs worth of dumbbells to the desktop. The top itself weighs about 60 lbs, so in total we had 150 lbs on the desk. A full cycle is one complete up and down motion. The travel is 20” per cycle up and then 20” back down. 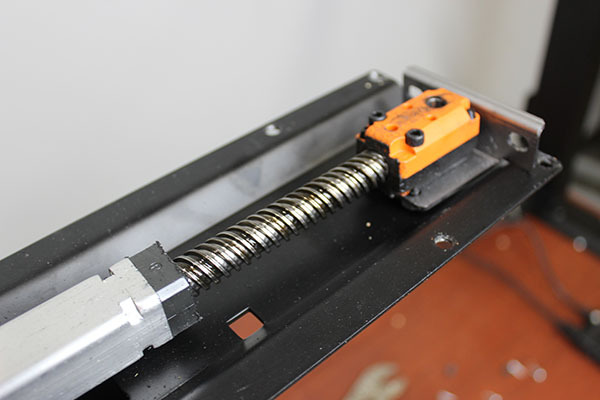 The test is fully automated with one half cycle every two and half minutes. This is done to prevent the overheating of our control box. After we reached 21,375 full cycles, we decided to pull the plug on the testing. By this point we had accumulated plenty of usage to see how things held up. Not to mention we were getting antsy. Before we started to pull the desk apart, we made sure to give it one last good test. With the weight of the desktop, Bill Knighton from K&A sat on the desk (215lbs) and gave it one last full cycle. After he rode the desk up and down, he tested the stability. First at max height, then mid point and finally the bottom position. After 21,375 cycles it was still pretty solid. To be honest, I was pretty impressed that the VertDesk v3 was still going strong. While you always believe in your own products, it was really reassuring to see that all of the development paid off. How much longer would the desk have operated? We’re not sure, but it was still strong after this round of testing. So, just telling you that the desk made it 21,375 full cycles doesn’t really tell the full story. We need to give you a better idea of what that breaks down to for the average user. Our numbers below illustrate worst case scenario, if you managed to use your desk 365 days a year. We hope that you take a break from work every once in awhile. In a 2013 study provided by FRED, the average american works approximately 1,700 hours a year. That equates to 212.5 eight hour shifts. If we bumped that to 2,080 hours, it would be closer to 260 eight hour shifts. Finally, if you worked 365 eight hour shifts, you would have about 2,920 hours worked annually. If you were to cycle your desk three times a day, you would average about 1,095 cycles throughout the entire year. I have been using a standing desk for close to ten years now and this is about how much I move the desk. It allows for me to stand for a period during the morning, then switch back to sitting. After lunch I will generally make the switch from sitting to standing a couple more times. Based on how others in the office use their desk, I would say this is a good average across the board for most users. If you are more of a power user, or find yourself working 12+ hours per day, you could be in this range. Power users will generally like shorter breaks between sitting and standing. This is a hard pace to keep up over an extended period of time. So, even if you find yourself around this range early on, there is a good chance you will slow down closer to average over time. How did the components hold up after 21,375 cycles? There are three main components of the VertDesk v3, outside of the electronics, that we wanted to take a closer look at. Since we had zero failures on the electronics, that part was already completed. 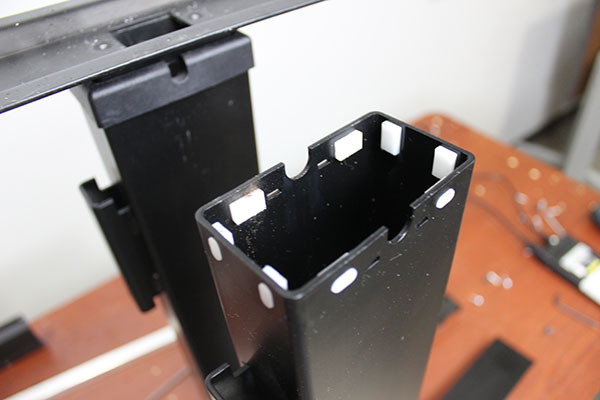 The next component we checked was the acetal glides. We wanted to see how much the Acetal glides wore down over the cycles. Then we checked the gears, seeing how smoothly they functioned and if there was additional noise coming from them. Lastly, we looked at how much paint had worn off the columns with the glides running up and down over the paint. 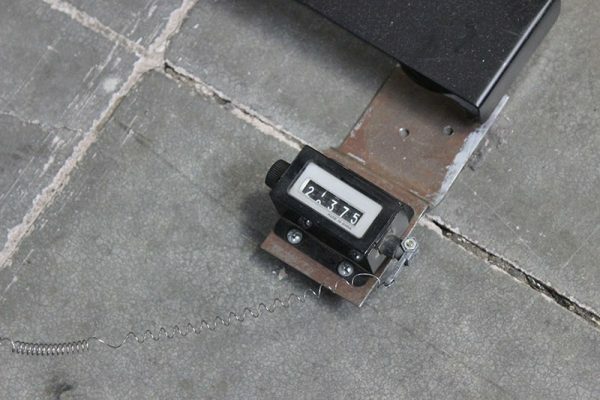 First, we took measurements of brand new glides to show what the thickness was before any cycles had occurred. 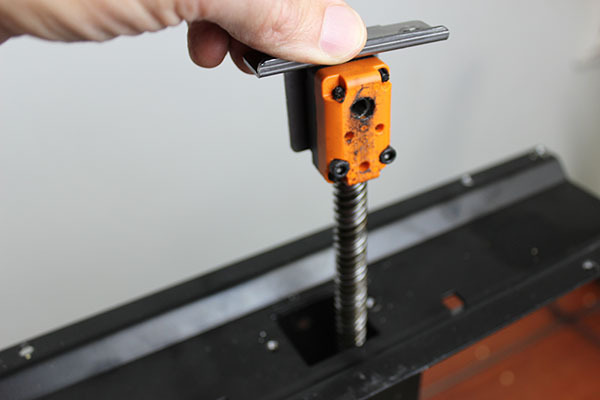 Each glide can have slight variances. 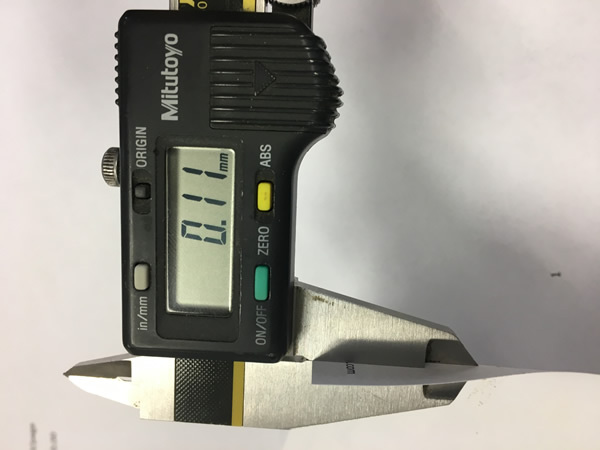 This particular model had used glides that were between 2.81 mm and 2.85 mm thick. 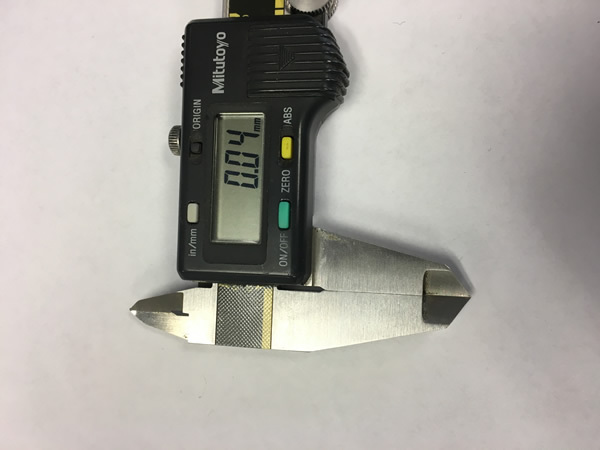 To give a better idea of what the difference in those thicknesses would look like, here is a picture with the caliper set to .04mm. It’s almost impossible to see through to the other side. 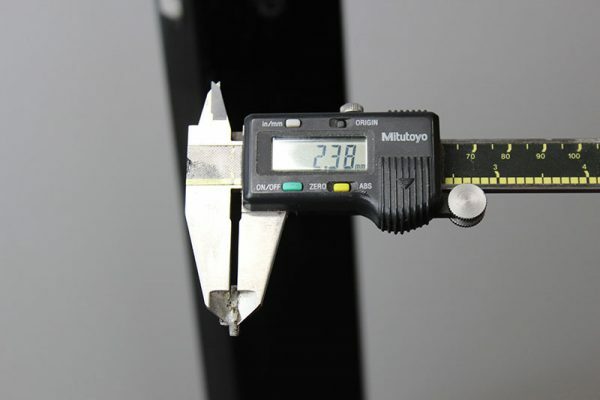 The second picture shows the caliber on a piece of paper, which measures at .11mm thickness. The inner and outer columns each have a set of eight glides. 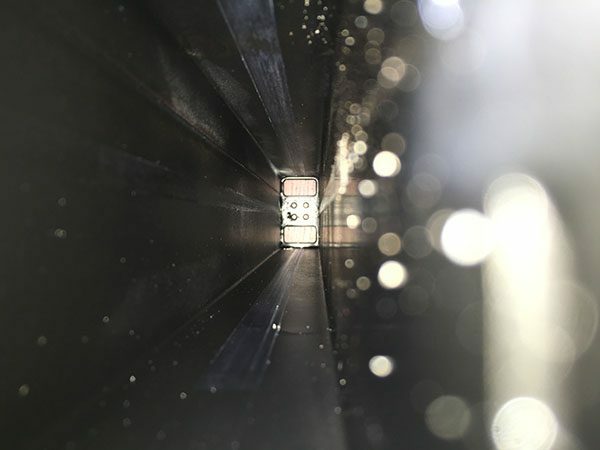 The inner column experiences the most wearing because it has to glide against raw steel. Because of this, the inner column glides are lubricated. Even so, the raw steel creates enough additional friction to wear them down faster than the outer columns glides. 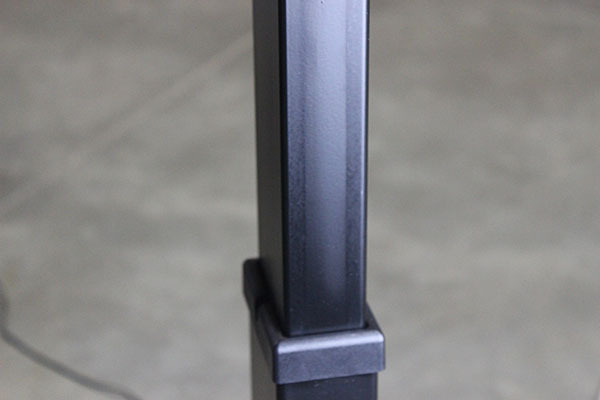 The outer columns glides slide on painted metal and this acts as a lubricant. This reduce the wearing quite a bit as the images below will illustrate. 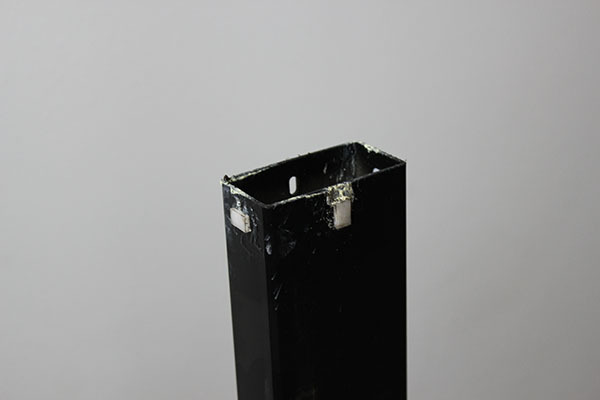 Outer column with glides that slide over painted column. Still look new. 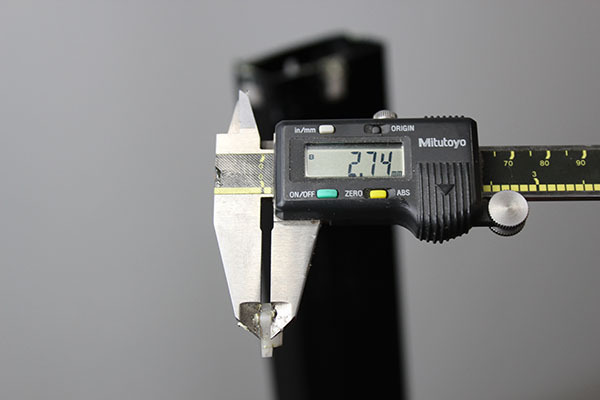 The glides on the inner columns wore down from 2.81 mm – 2.84 mm to 2.38 mm – 2.41 mm. This is about the thickness of four pieces of paper. 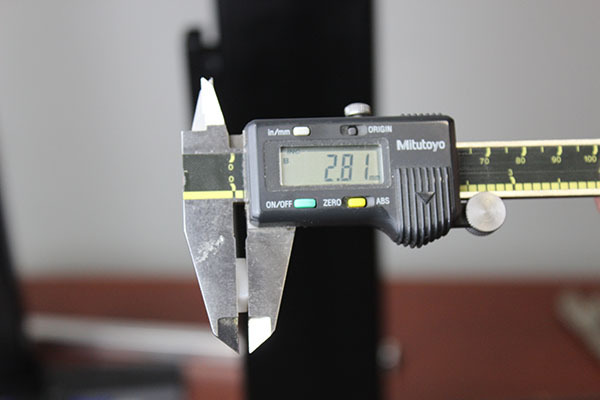 The glides on the outer column wore down much less to around 2.72mm – 2.74mm. 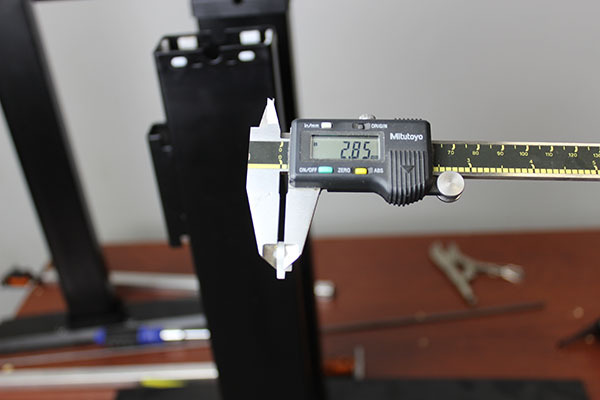 With the minimal amount of wear, the VertDesk v3 was surprisingly stable even after 21,375 full cycles. The second component that we looked at was the gears. With this many cycles they were bound to show some signs of wear. 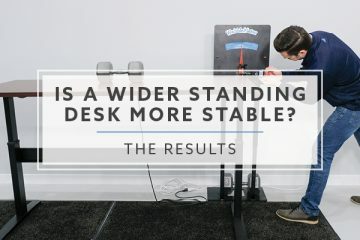 Typically you will notice that standing desks are not as smooth during their movements. There will also be some signs of added noise as the gears are in motion. Most importantly though, we wanted to see if they would still function. After we pulled everything apart you could definitely tell the gears had been through hell. There were clear signs of the cycles on the hex input. Surprisingly though, the gears themselves were still smooth. As we pulled them in and out you could feel how nicely they still moved. The coloring of the gears was darker than what they looked originally, as there was plenty of grease showing from the cycle testing. The last aspect of the frame we wanted to inspect was the wearing of the paint on the inner column. Because this is where the outer columns glides make contact with the inner, there is almost always wearing that will show. While there were rub marks showing, it was much less than would be expected from this many cycles. Overall, we were very happy with the results here as well. I hope that by showing you the amount of effort we put into the VertDesk v3 you can see that we are different. You won’t find another brand that provides as much real information on their product as we do. It’s likely because there aren’t other resellers online that have actually developed their desks. Instead, they have partnered with Chinese or US based manufacturers to provide a finished product. This puts the design and development on a third party, leaving the reseller with little knowledge of the inner workings of their own products. I have personally worked alongside Bill Knighton from K&A Mfg (my father), developing a quality product with the VertDesk v3. We didn’t cut corners to bring our costs down. What we had created with the original VertDesk v1 and v2 is well documented. 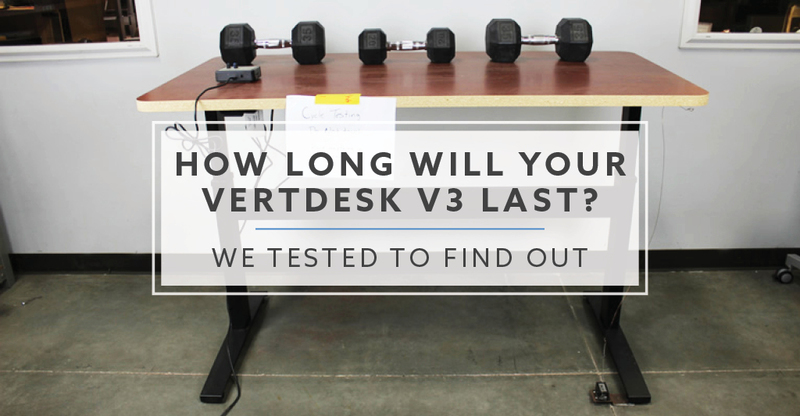 Our VertDesk v3 improved upon all of the failures with those products. Starting from the ground up, with a completely redesigned frame. We are proud of what we created in the latest iteration of the VertDesk v3. After extensive testing, we are confident that you will be too. 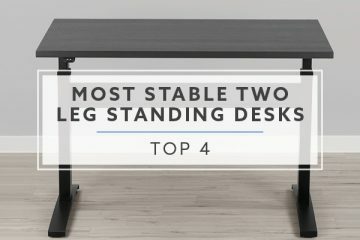 Is A Wider Standing Desk More Stable? We Tested To Find Out.